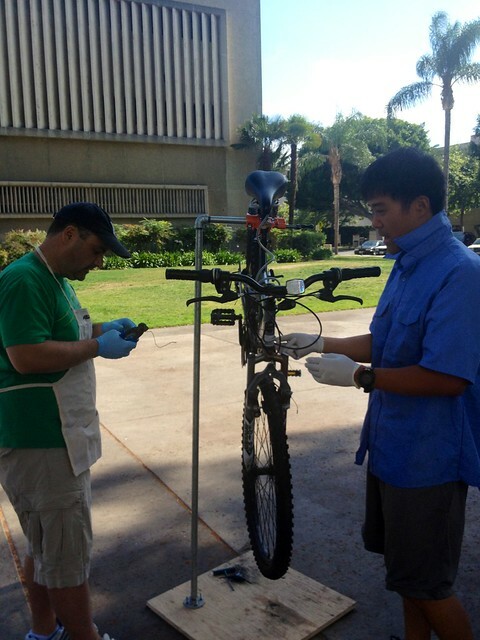 You may remember seeing Andrew Li’s Homemade work stand being used while were were out fixing bicycles for the homeless. I asked him to provide us a tutorial on how he built it and he did not disappoint. Thanks again to Andrew for providing us this article. One of the most rewarding sensations that can be experienced as a human being, amongst certain biological functions, is probably making something with your own hands through a process that is both time and cost efficient, which ultimately produces an item that works well and can perform its task reliably for a long period of time. 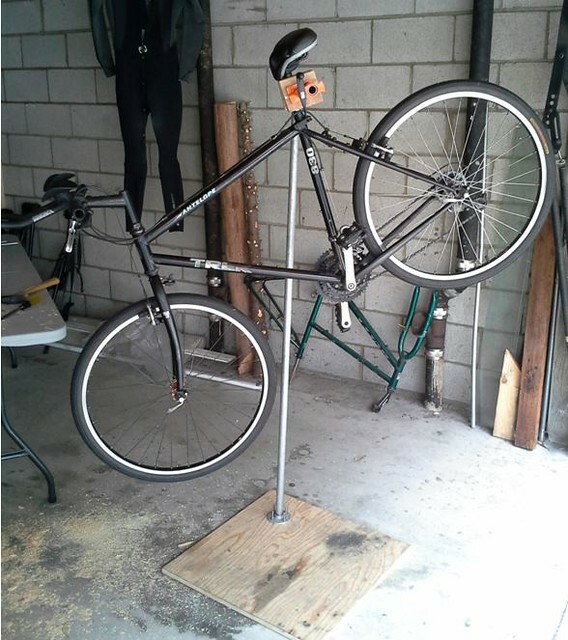 From my experience building and using it, this Do-It-Yourself bike repair stand certainly fit the bill. It cost me about $50-60, took about 1.5 hours of work, and has been working fantastic for the past 2 years without any issues. The pros of this design are that it is inexpensive, quick to make, durable, and does its job well. 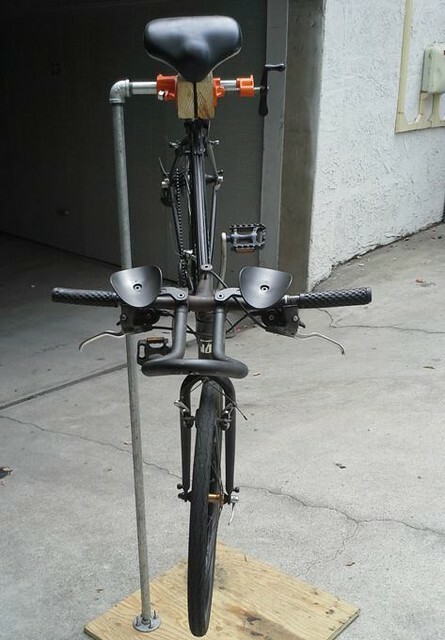 The cons include not being able to adjust the height of the stand, not really being able to adjust the angle of the bicycle when it is clamped, and the limited nature of the stand’s portability (i.e. it can’t fold up or telescope, although I suppose you could unscrew everything and reassemble on site, though this would be rather inconvenient). That being said, I have been able to transport the stand pretty easily in my old beater BMW, of course with no one else in the car but myself. What I present is essentially the same principle with slight variations. The moral of the story is that you can make your own tweaks and adjustments to fit your preferences and needs. – Spade bits (to bore wood) of varying sizes, from ¾ inch to 1 3/8 inch. I chose galvanized pipe because of the zinc coating for better water corrosion resisting properties, especially if you are accustomed to using warm water and suds for drive train care. I have not had any problems with rust. Black pipe is OK, but its intended purpose is the conveyance of gas and air, so is more susceptible to water corrosion. 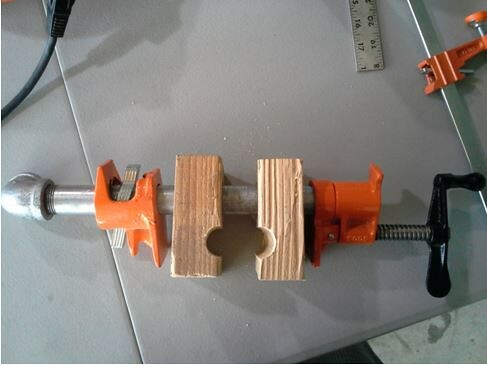 -Place the flange in a corner of the plywood. I put mine so that the edge of the flange would be 6 inches away from the nearest corner. For me this distance offers the greatest stability (i.e. the weight of the bike won’t tip the stand over, and yet the flange is not so close to the corner that the weight of the bike torques and bends the corner of the plywood board). -Using your 1” spade bit, bore out the central opening (this opening in the plywood will allow clearance for the pipe you will be screwing into the flange). 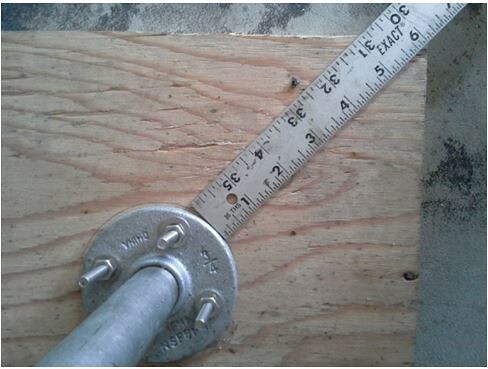 -Drill out the holes where you will secure your flange to the plywood with your nuts and bolts. 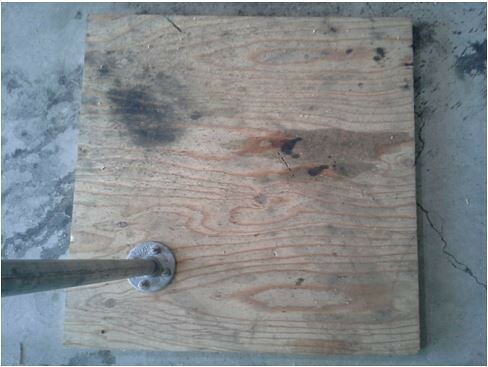 -On one side of the 4 holes you made for the bolts, bore shallow holes (about 1/8” deep or so) so that the head of the bolt can fit nicely inside thereby maintaining a flat bottom surface of your plywood board. 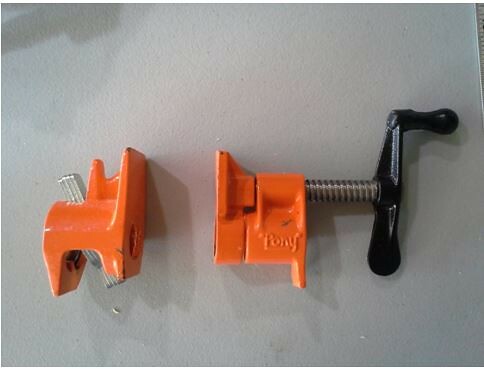 Attach your flange with nuts and bolts. 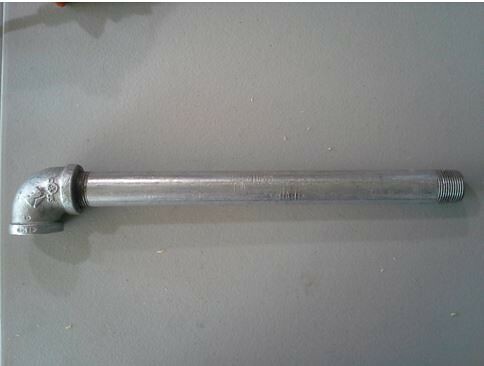 If you want, you can also saw off the excess ends of the bolts. Attach your 5 foot galvanized steel pipe into the flange. 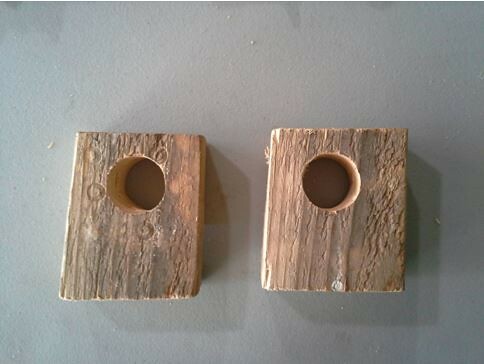 Take your 2 pieces of scrap wood (2×4) and bore out a 1 3/8 inch hole for each piece. You can probably bore a 1 1/8 inch hole as well. The goal here is to be able to fit the pipe into these holes comfortably. -Slide the clutched end of the Pony clamp (NOT the crank end) first onto the 1 foot pipe, followed by the 2 pieces of wood, and finally the crank end of the Pony clamp. 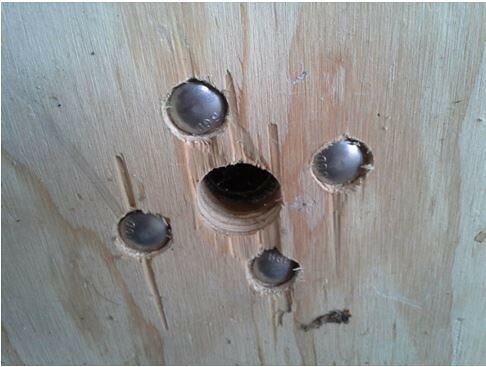 -Bore a 1” hole through the wood “sandwich” right along the plane of the wood-to-wood interface. I started boring from top down, and then converted to a side-oriented approach so I didn’t bore through my work bench. 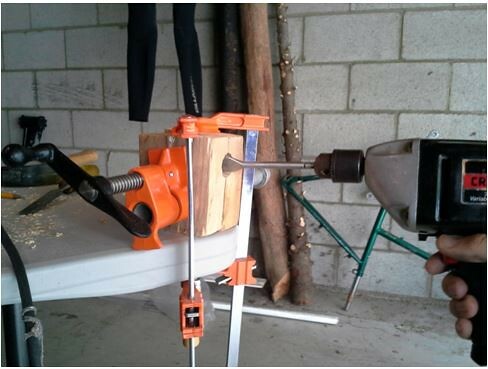 -This will create a “half-cylinder” on each piece of the wood, producing a nicely fitting clamp for your seat post. 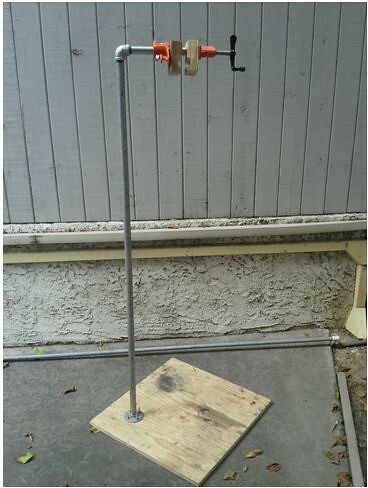 Now attach the 1 foot pipe/ clamp/ wood piece with the top end of the 5 foot pipe. Screw securely. You are all set. Try to clamp your bike as close to the end as possible so you get the most room to move around your pedals as you clean, tune, fix etc. Best of luck. Do good and ride well. This is pretty cool — I do applaud the effort to DIY something. I guess I’d be a bit more excited if I had the parts on-hand and didn’t have to shell out $50-60, knowing that for a few dollars more I could buy a fully functional, adjustable repair stand. 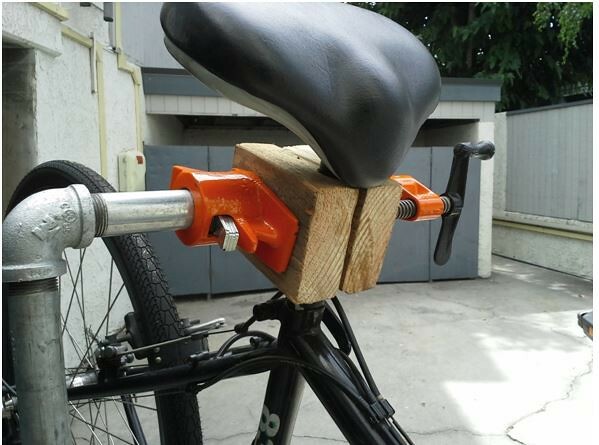 I’ll bet this stand is more stable than the cheapies from the big bike brands, though! David, no problem. Happy building! And actually, before you set out building it, I should say that Jack brings up an excellent point. I literally just searched for portable bicycle repair stands and quickly found what appears to be a pretty good quality stand for $44. Maybe worth taking a second look. However, I had a BLAST making the stand. So if anything, that $50-60 also pays for a stupendous surge of serotonin. There IS something to be said about doing it yourself — dreaming up a design and fabricating it with your own hands. Sometimes that is worth the extra money and effort. Personal satisfaction is priceless, after all! I built a very similar stand with the only difference being the base. I used a t section going to two L-shaped sections of pipe to form the base. It’s actually a great stand. I found a diy angle adjustment online, but haven’t felt the need for it yet.